Homepage // NZ Plumbers Association Inc. If you want quality workmanship and a professional service then look no further than the New Zealand Plumbers, Drainlayers & Gasfitters Association. Established in 1894, our Association is here to "Protect the Health of our Community"
We promote awareness of the standards required and to develop the profile of New Zealand Plumbers, Drainlayers & Gasfitters. Our members are fully qualified and honour a code of conduct. 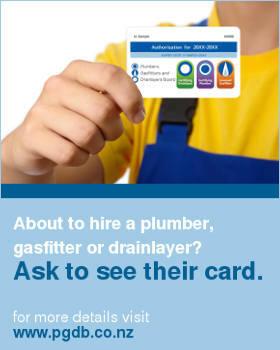 Please use the SEARCH function to look for a New Zealand Plumber, Drainlayer or Gasfitter in your area.